During the 1920s and 1930’s the country was suffering from a depression, our local coalmine was closed and most of the parishioners unemployed. Someone had an idea. 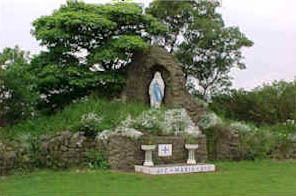 the idea was to build a grotto in honour of "Our Lady Of Lourdes". The idea was two fold, one was to find work for idle hands, (unpaid of course) but it would relieve boredom. Second was to ask "Our Lady Of Lourdes" to reopen the coalmine. Mary’s statue was built to face the colliery. Lots of underground stone had been brought to the surface and deposited on a huge spoil heap. Permission had to be asked of the Colliery Manger to use the stone to build the Grotto. The manager kindly agreed to all requests and even provided the transport. This was a huge task for unskilled men, but the operation was duly completed. Our Lady answered the prayers. The mine reopened and the miners returned to work. The Colliery has long since closed, but Our Lady still stands looking at the site where the mine once was and no doubt smiling with the men who built her shrine, not for money but for love. Information supplied by Nicholas Spooner and Austin Carr.